If by some accident you have never heard of Phil Keaggy (#7), here’s a video that gives an idea why he’s all over my music library. This is “Addison’s Walk” from Beyond Nature, which was a staple of my graduate school-days listening diet. With Harrison’s arrival on the 15th, I have had neither the time nor the raw material for blogging about math, education, or technology. Instead I’ve been mostly figuring out how to decrypt my new son’s little coded messages and trying to sleep when I can. But there is one tech item from my experience of the last week that I would like especially to highlight: the ongoing awesomeness of the iPod touch. – I used the iPod touch to provide real-time updates of my wife’s delivery — well, at least right up to the point we went to the delivery room — for friends and family using Twitter and Facebook. I was even able to make some short posts to our family blog, although blogging on the iPod screen keyboard really takes it out of you. – I found out that while you’re in the hospital having a baby, the moments of genuine excitement are intense but sparse. Mostly there are lengthy periods when you’re just there in the hospital room with nothing to do. Fortunately before I came to the hospital with the Mrs. I stocked up the iPod with every LOST episode I owned and a whole bunch of podcasts, so when baby and mom were asleep and I wasn’t tired (ha! Remember when I wasn’t tired?) I could fend off the boredom. – Although I have never actually done this, you could use the iPod in its originally intended mode, as a music player, to play back calming music to a newborn with one hand while holding the baby in the other. – Perhaps the most frequent use of the iPod touch has been during my overnight shifts looking after the baby. These are usually from 8PM to midnight and involve trying to lay down in a quiet, dark room knowing that any attempted sleep is going to be interrupted by a suddenly hysterical baby. The first night we were home and I was on deck, I ended up rocking the baby in my left arm while seated and using my right hand to Twitter to the outside world. Now this has become something of a nightly live-blog of my exploits as parent-on-duty. I use the tag #babyshift to highlight these posts. 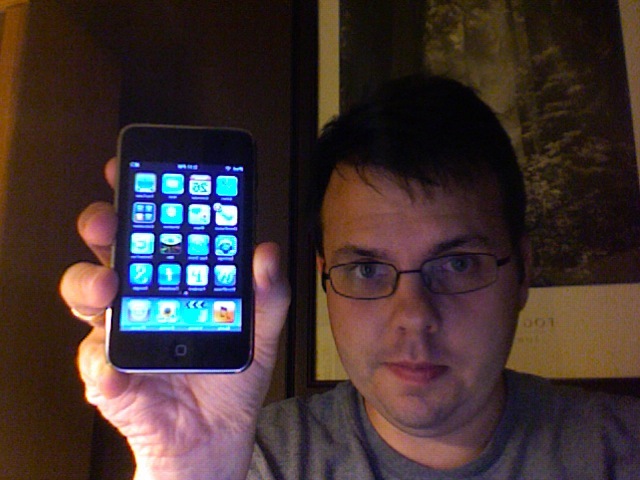 So here’s to the iPod touch and the whole idea of mobile access to the Internet. The story left off with me giving up trying to justify spending $399 for the 32 GB model, even though I’d saved up for it. Cheapness is in my DNA, and I’ve never been able to spend money on anything without feeling like I should have stuck it in a savings account instead. But, one day, my wife comes home and informs me that the daughter of one of her co-workers works at the Apple Store in Indy and gets a 15% “friends and family” discount. After trading a few emails, the deal was set up, and a few days later I had my grubby hands all over it (you see just how grubby your hands really are with this thing) with $60 knocked off the price. So, you see? It pays to wait. It’s incredibly thin and light, yet it also feels very sturdy, and despite having an all-shiny-aluminum back I haven’t seen any big scratches on it yet. The screen is just unreal. Such crispness and clarity. Wifi speed is quite decent, and the Safari browsing experience is just fine even on sites that show up in very tiny font. The built-in apps are hit and miss. Besides Safari, I’ve really liked using the Mail app (although our stupid MS Exchange server at school can’t be accessed off-campus except through a web page…), and the Maps app is absolutely killer. The Calendar app will be really useful once I figure out how to get my iCal calendars to sync with it. The YouTube app just seems really slow. Weather is OK. Calculator is cute. Stocks, Notes, Contacts, and Clock are unnecessary. As a straight-up music player, the whole informatics/human-computer interface aspect of the Touch is amazing. What I mean is that it’s not so much the high fidelity of the sound reproduction that blows me away but the ability to quickly browse and access songs and videos. Not a square millimeter of screen space is wasted; everything is logically laid out and easy to use. This was the same kind of feeling I had when I first used a second-generation iPod with a click wheel. Videos are a real treat to watch on this, and it’s been lots of fun exploring what video podcast content is available out there. I’ve downloaded some free apps: IM+ for instant messaging, a WordPress app for blogging (haven’t tried using it yet), Pandora (where has that been all my life? ), Facebook, WeatherBug. I’ve downloaded a few more that I immediately deleted because it was crap. There seems to be a lot of good free stuff out there and a whole lot of good paid stuff and about an equal amount of crap (free and paid). I’m hopeful that the app selection will keep growing and growing so that although the crap-to-noncrap ratio might stay constant, the amount of non-crap will increase. I also paid $20 for the iPhone/iPod Touch version of OmniFocus, the “desktop” version of which I use religiously for GTD on the Macbook Pro. I’m still getting used to it; the main advantage is that I can synchronize tasks to and from the Macbook using MobileMe (we still have 4 months left on the subscription we got for Christmas last year). But it’s nice — rather than carting around a stack of 3×5 cards or a Moleskine for on-the-go task collection, I can just use the iPod. I’ve gotten surprisingly good at using the little pop-up thumb keyboard that you get whenever you have to enter text. The battery charges a lot faster than my old iPod (about 60-75 minutes from 0% to 100%). And if you leave the wifi off, it seems to get a lot better battery life too. But if you use the wifi, the battery life drains out fast. Not surprising. I could go on, and I probably will, but here’s something that sums up how much of an impact this little device is having on me. I had to go to an ATM to get some cash, and when it prompted me to enter “OK”, I started tapping the screen. It took me 10 seconds or so to remember that I had to push a button instead. I wouldn’t have been surprised if I’d tried to pinch and zoom on the ATM screen. So I’m very glad to have waited until I was capable of getting exactly what I wanted, and comfortable in getting it. In case you’re unfamiliar with this process, there are people who make a living off of coming by professors’ offices and purchasing unused books for cash (at a rate far less than their retail value) and then selling them to the open market. Ever wonder where those used books in the college bookstore come from? Some of them come from students, but a lot of them come from the buy-back people. But there’s an ethical dilemma. A lot of the books I am selling back are review copies which were sent to me, gratis, by the publisher. This practice of sending out free books all the time is a major contributor to skyrocketing textbook prices. I’m having some guilt pangs about taking the money I get from selling books, which I received for free but for which students have to pay exorbitant amounts, to buy an iPod. On the one hand, I feel like I am profiting from students’ misfortune. On the other hand, by selling books back to the book-buying dude, who will then sell them at a cut rate to campus bookstores, I am providing a robust supply of lower-cost pre-owned books to students who would otherwise have to pay a lot more for the new versions. And let’s face it, I really want that iPod. Help me buy an iPod, or not. Apple today announced the newest iteration of the iPod nano and some changes to the iPod touch, among other things. This has been an eagerly-awaited day for me, since I took the honorarium from my April gig at Benedictine University and salted away most of it to get an iPod touch once the updates came out. But I must admit that I was really hoping that the 32GB model would be under $300; I was $100 off. So I turn to the blogosphere to help me decide how to blow my stash. Constraints and preferences: I have $232.50 saved up. I have 12 GB of music (just music, no video) in iTunes and I would like to carry all of it with me plus some video. I would like — really like — to have mobile access to wifi in a handheld device. I currently have a 20GB photo iPod (second generation? third generation? something like that). And coming up with a whole lot of extra money — OK, well, really any amount of extra money — right now is doable but difficult to justify in the family budget. Go for the 16GB iPod touch at $299, which is pretty close to what I have saved, and just deal with having 4 GB less space on the device than I currently have? Somehow (!) come up with $150 and go for the 32 GB iPod touch? Forget the iPod touch and go out and get one of the new nanos, which at $199 I can buy right now with no extra funding required and still have some left over — and muddle through without the mobile wifi? Do nothing and just wait around for the next round of upgrades? Go ahead, spend my money for me! After saying that Apple needed to add more storage to the iPod Touch before they could count on me buying one, they have obliged. Unfortunately the prices haven’t changed, and the 16 GB (which would just barely be big enough for me) is still $399. The new 32 GB model is $499. Look: $500 is way too much for a music player, sorry, no matter how much stuff it does. Now all Apple has to do is make the 32 GB model $399 and the 16 GB one $299, and we’re in business. or better ye, make the 32 GB model $299. Or maybe $29. After writing my two recent posts about the Amazon Kindle, I began to notice that I was not only unimpressed but bothered, even angered, at certain elements of the Amazon Kindle. I don’t usually get ticked off at an electronic gadget I don’t own, so I had to think about what my problem was. After a while, I pinpointed the cause: It’s the way Kindle handle blog subscriptions. You can get blog content sent straight to the Kindle, but only the blogs that Amazon chooses to offer you, and only after paying a fee. Most blog “subscriptions” on the kindle are $0.99/month. Cheap, negligible even, but still not free. And this strikes me as being simply wrong. The power of technology consists in its capacity to be a liberating force in our lives. This goes all the way back to foundational technologies such as electricity, indoor plumbing, the automobile, and so on. The reason we include technology in our lives — the reason we keep buying new technologies — is not so that we can own a device. We own the device because in some kind of sum-total way the technology makes us more free. Take the iPod for instance. It does cost you something to own an iPod, apart from the cost of the device, namely that if you get your music from iTunes you had better be ready to own only iPods for the rest of your music-loving days, thanks to Apple’s DRM. But that opportunity cost is offset in numerous ways. The iPod and iTunes make me free to buy only the songs I want rather than the whole album, to try new music at low cost, to arrange music and play back music the way I want, to carry literally 20 years’ worth of collected music with me in a small, sleek, and incredibly well-designed package. Or closer to home, consider computer algebra systems like Maple or Matlab. Of course it’s cool that these programs can do symbolic integration or calculate π to the 100,000th decimal place. But what makes them powerful and not just cool is the way that they free mathematics students and researchers to concentrate on learning concepts and big ideas, or making observations and reasoned conjectures, rather than having to worry about whether our calculations are right all the time. And so here comes the Kindle, and from the get-go it starts locking me down in all these different ways without giving me any truly freeing technological advantage in return. You can buy books straight from the device; but all the books you already own have to be re-bought and sent to the device. You can send your own text or Word documents for viewing on the Kindle, but only through email and only after paying a fee to do so. That’s your own content being put on your own device, and you’re being charged for it. And don’t get me started again on the lack of PDF support. In this situation, the overwhelming message being sent is that Amazon is not interested in making a product that will revolutionize the way I conceive and consume books, but rather a product that will make them lots of money, to be made in turn on expenses both big and small and not all of them necessary or even warranted. This just isn’t the kind of technology that the world needs today.